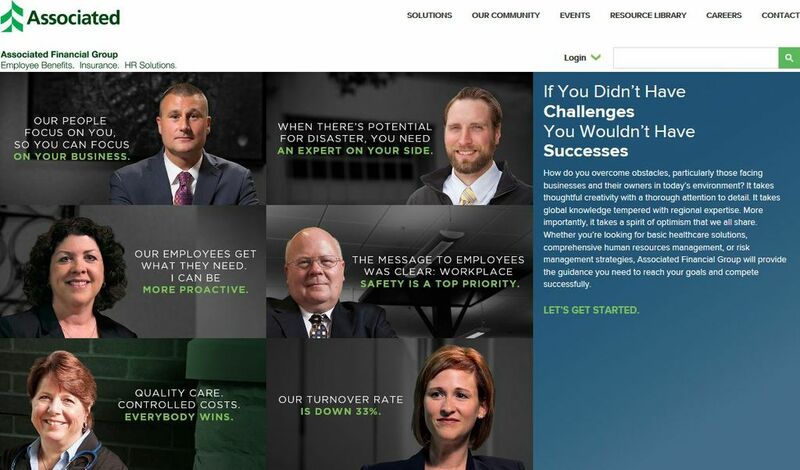 Associated Financial Group (AFG) recently launched their new website with significant upgrades and enhancements. The website and e-marketing program are consistent with Associated’s brand presence by telling their story through their clients, assisting with prospecting and recruiting efforts, enhancing engagement with clients and prospects, and improving functionality and navigation. Visitors to the site will see and hear the AFG story through client stories. “This approach helps clients and prospects relate to our solutions by hearing about them from their own peers,” said Bill Bohn, EVP, head of PCIS, president and CEO of AFG. Other enhancements include improved functionality and navigation and an enhanced e-marketing program. In the past, AFG emailed eLine newsletters to subscribers on a monthly basis. The newsletters cover an individual topic such as human resource issues, employee benefits, risk management and safety, hiring and retention, healthcare reform and retirement planning. Email will continue to be the primary content distribution method, but subscribers will receive a periodic recap email customized to their individual topic and upcoming events preferences. They will be directed to the Resource Library that houses educational content, including articles, case studies, eBooks, issues of their magazine and annual trend reports. With improved navigation and filtering options, anyone visiting the Resource Library will be able to browse content by topic, author and content type to quickly find what they are looking for. The Resource Library will also promote reader engagement by allowing comments on articles. Readers can quickly and easily share information via email or on other social networks using the share bar attached to each article. Subscribers will receive two to four emails per month, and if no articles of interest are posted, no email will be sent. Visit the new site at www.associatedfinancialgroup.com/ or for more information, call 800-258-3190.